Loved this! Such a nice change from regular old stir fry! This was amazing and so filling! This was amazing. The flavors are wonderful and the vegetables are just the perfect amount of crunch. We will definitely make this over and over again. I already can’t wait until next time. Yummm! 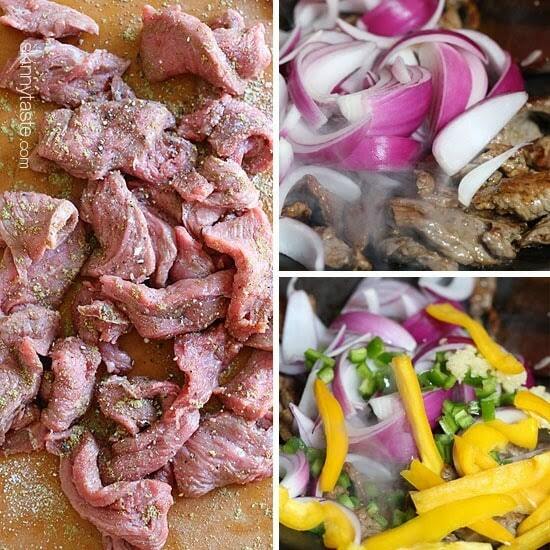 I’ve made this recipe with steak and chicken and it’s easy and delicious- and I’m not a cook. Thanks so much! My hubby made this tonight and it was FANTASIC! So good we can’t wait to make it for dinner guests! Our 8year old loved it too. Definitely a keeper. My Husband loved it and asked me to add it to his favorite recipes binder and make it again soon. Was awesome with the Peruvian Green Sauce. Thanks Gina, another favorite! Do you have a recipe for the green sauce that Peruvian restaurants use? Love this!! As a Peruvian it’s one of my favourite dishes❤ You can find Aji Amarillo paste in some Latin groceries here in the states, add a couple of tablespoons and it gives the best flavor! This dish has been a lifetime fave, so I was skeptical about a lightened up version. I made it as directed, but I was deliberately careless with the jalapeño seeds since we love spicy food. We had it with the Peruvian green sauce. It was delicious (like every one of the Skinnytaste recipes I’ve tried), and the portions were huge! And I didn’t miss the rice at all. Gina, can you do anything with. papas a la huancaina or ají de gallina?? This was restaurant great! Happy campers! This was ridiculously delicious! I’m a pretty good cook and my husband thought this was one of the best meals I’ve ever made. The flavors just all work so well together and it’s very satisfying. 5 stars for sure! I made this tonight. It is awesome. Easy and delicious. And something a little different. Yum! Since marrying a Peruvian 18 years ago, Lomo Saltado is a staple in the house but I prefer pollo saltado which is the same recipe except it’s with chicken. What do you think the freestlye points would be for the pollo saltado, switching out the beef for chicken? I have made this many times and it is absolutely delicious! Turned out great! This will definitely be a regular for us. I spent a year in Peru, having been married to a Peruvian. I fell in love with the cusine of Peru even before I went there. 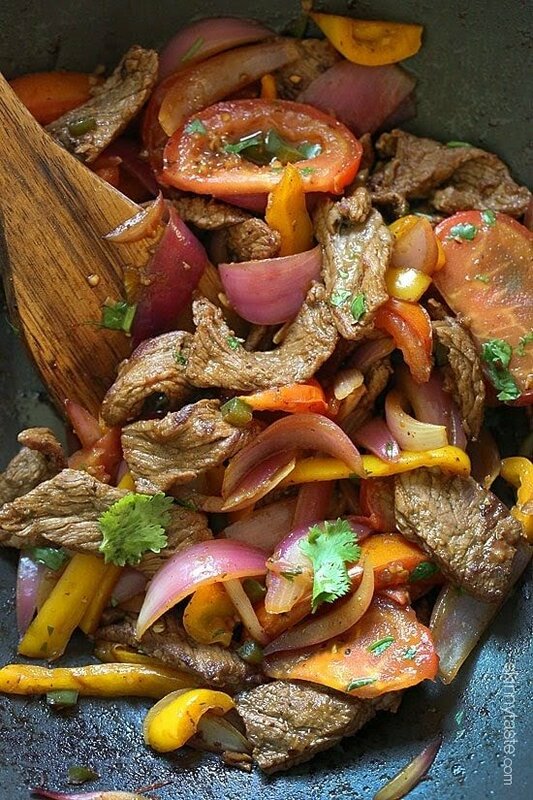 Lomo saltado was one of the first dishes that was taught to me when I was in Peru, and this recipe came closest to what I knew, then any of the others that I have seen in the internet and in cookbooks. Thumbs up and 5 stars! You made my day!!! I usually don’t put the potatos because I serve it with white rice , love love rice (another peruvian thing) . Recipe is really good . Thank you again!!! This dish was so yummy and different! My husband and I enjoyed it very much. I have never thought of pairing potatoes with a stir-fry dish. Wonderful recipe. We loved it and can’t wait to make it again. I’m looking for a recipe for a pollo salteado. Can I just swap out the beef and replace it with chicken for this? I want to get it right the first time. I love this recipie! I have made it a few times and it get’s two thumbs up from both my husband and I! I’ve been to Peru and had the real thing – and this is a delicious, healthy version! yum! Wonderful flavors! We will be making this often – super good and a lot easier than it looks. So good! The portions were huge, but we scarfed every bite! It wasn’t a lot of potatoes but enough that I was satisfied. My husband said he didn’t feel like he was on a diet at all! We started the morning with our Skinnytaste omelets and finished our day with this. So happy to have found you Skinnytaste! I have to tell you how much we love this recipe at our house. My husband asks for the “flavor explosion in my mouth” which is his name for this recipe. Thanks a ton– always good to have a new recipe in the rotation! Great dish! Didn't miss the fried part or extra oil at all. Split a package of beef to make this and beef and broccoli from the cook book…we now have 2 new favorites at our house! 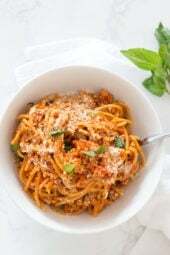 This is one of my favorite dishes from your site. The flavors are delicious. 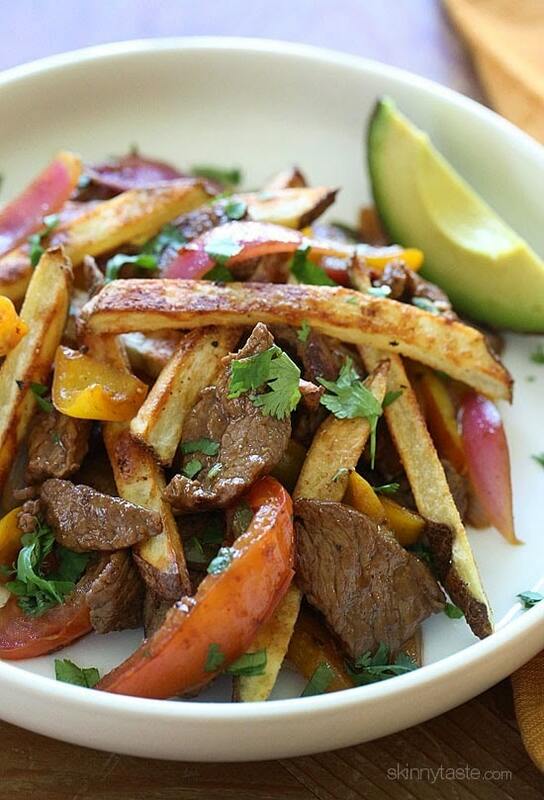 I've never had Lomo Saltado, but I am now a fan…of this, and many of your other recipes! I made this for dinner tonight and it was delicious! This is one of my favorite dishes at the local Peruvian restaurant and your version did not disappoint! My husband loved it too. 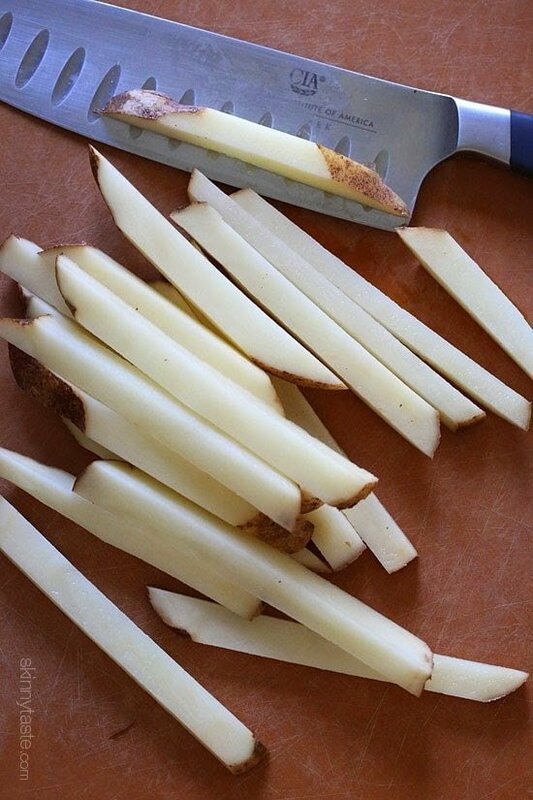 My kids loved the French fries, but their opinion hardly counts since they're going through a picky stage. Why does the recipe call for olive oil? Wok cooking / stir fry is high heat (as this recipe directs) for which olive oil is ill suited. I made this the other night and it was really great! I'd like to suggest that you brown your steak quickly and then remove and set it aside while you stir-fry your peppers and onions. That way your veggies pick up some of the brown bits left by the steak. Add the steak back in when you add the tomatoes and sauce ingredients, just to heat everything through. My fries took longer to get crispy than stated, so next time I would bake in the middle of the oven rather than the lower third and turn the temp up to 425. The sauce in this is amazingly good. This is definitely going into our dinner rotation. Thanks for a great recipe! This was really good!! It was also perfect for an easy weeknight meal! This was awesome! I made it with seitan instead of beef since I'm vegetarian, and it turned out great! Surprisingly good! 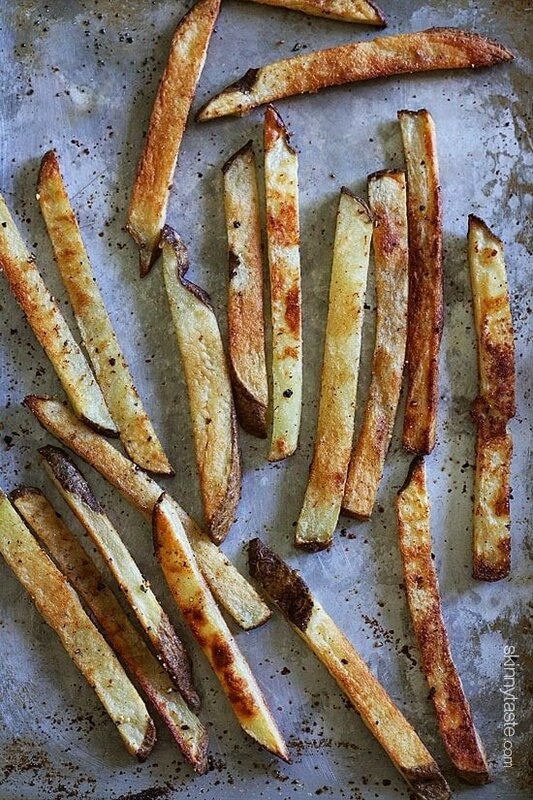 The oven fries make the dish, especially when they soak up the tangy vinegar sauce. 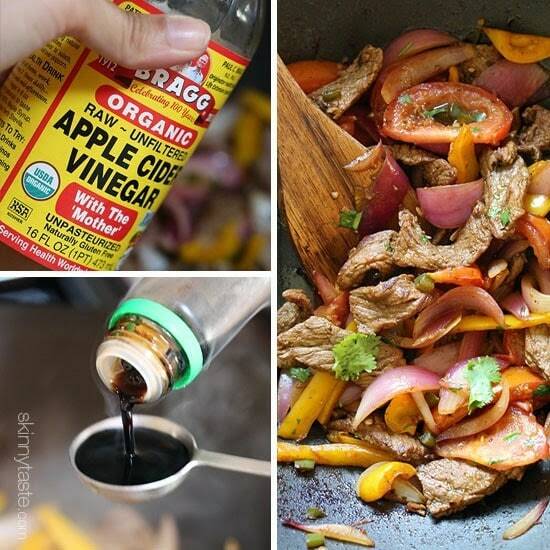 My husband had the leftover stir fry over rice for lunch the next day…he said it was okay but better with the fries. I did switch the order around by doing veggies first then beef so the meat would not overcook. yummy! Just made this for dinner and it was delicious! Out-freaking-standing! LOVED by all!!! WINNER! Made this for dinner and it was a HUGE hit! It will be in our regular rotation for sure! Thanks so much! Made this meal tonight… I added another 1/2lb of sirloin and a potato and broke it into 4 servings so that I could have leftovers. I also used a poblano pepper instead of jalapeño since I am not a fan of those but love poblano peppers. On my recipe builder it ended up being the same points! So excited! It was such a flavorful and filling meal. Thanks Gina for always having meals that are so yummy and wholesome! Did you double the time when cooking when doubling the recipe? I broke down the ingredients by weight watchers points and then calculated the points a second time using the nutrition information you provided, and it might be possible that this dish is even "skinner" then noted. When breaking down the ingredients I calculated one serving as having 7 points, while your nutrition information came out to 5 points. Thoughts? I made this last night and I can't tell you how much I loved it! It's spicy but not too spicy. Felt filling but also healthy. I'm already planning to make this one again soon. Thanks for the recipe! Made it without cilantro and jalapeño. It was awesome!! A few people in my family are allergic to tomatoes. Do you think the recipe would be just as good without? Made this tonight and it was so flavorful, and so pretty. Great recipe!!! Made this last night and it was so fantastic! My beef/veggies were saucy and yours didn't look saucy, but regardless I enjoyed the sauce over the potatoes! So delish! Love all your recipes! Vacationing in Colorado! My daughter made this last night and we all loved it. Delicious flavors and the avocado is a great addition. I made this tonight & it was awesome! Very generous portion for 8 PTs abd the fries made me feel like I was cheating! Delish! Husband raved about this :). This was so good! 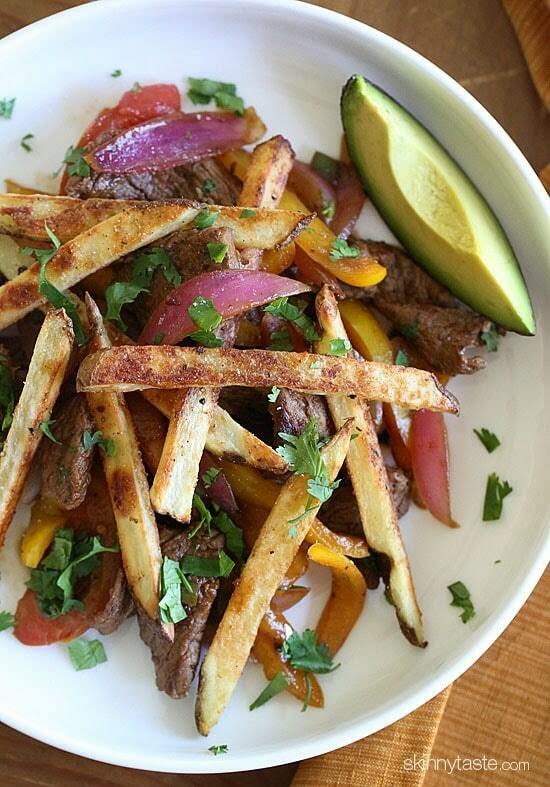 One of my favorite meals of the many many Skinny Taste recipes we have made. Wonderful! Reminds me of Peru :). Next time, I think I'll reverse the order that things go into the pan. The steak overcooked a bit by the time the onions were soft. But other than that, perfect! Would have never guessed the ingredients in the sauce but the whole is certainly greater than the sum of its parts. Thank you! This was dinner last night. I have never been disappointed in a recipe from your site, Gina and once again, you hit a home run with this one. Simply delicious. I LOVED the oven fries with the stir fry. I will be making this one again and again. What a fantastic dish, Gina! Once again, you've managed to lighten up a dish without losing any of its appeal. I'm not loving all these carb counting and 'clean' eating posts. I love Skinnytaste because you've never subscribed to those things before, and instead focused on regular food that's simply lightened up. This recipe has potatoes, so it's certainly now a no-carb recipe, plus all my recipes have always been clean! I know many different people follow my blog with all types of diet restrictions, vegan, gluten-free, paleo, etc and I always let people know when a recipe fits their restriction, but always the recipes are WW friendly. Delicious! I made this tonight for dinner and we absolutely loved every bite. 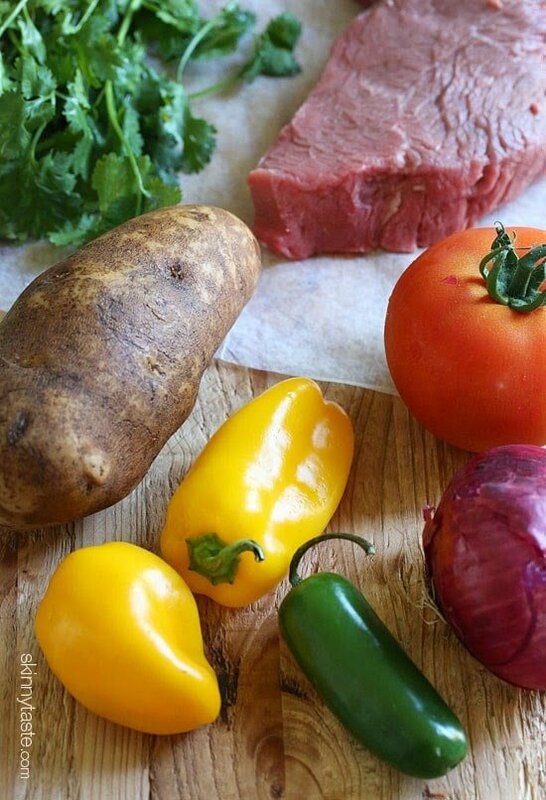 Just one point – where do you add the bell peppers? I couldn't find this step in the recipe so I put them in with the onion and garlic. Did I just not see it or isn't it included? Anyway, we LOVED this dish and I'll be making it again soon. Thank you. Sorry, with the jalapeno, I will adjust! Another great skinnytaste recipe! This must make the best recipes of 2014 ! What a creative recipe! I can't wait to try it! This recipe is fabulous!!! Thank you! I love your site!! 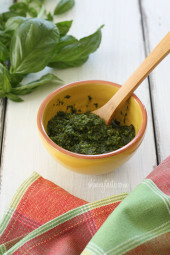 Anyone know the recipe for the cilantro dip that comes with the lomo at the restaurant? Gina, how would this work out if I uesd chicken instead of beef? My family doesn't eat beef or pork. That's another common way of making this dish. In that case it's call pollo saltado instead. Peruvian food is one of my favorite cuisines. Here in Miami, there is a Peruvian restaurant or food truck on every corner. Most places offer chicken, steak, pork, and even seafood saltado. You could add pretty much any protein and it will be delicious. This was my favorite when I went to Peru a few years ago! Good memories! Looks awesome. Thanks for defending potatoes too. I don't know who came up with the whole "they're not good for you" thing. I don't eat too potatoes often but it is because I grew up in Puerto Rico and we eat so many other tubers that taste better (and are also good for you), so I never got use to it. Why am I seeing this at night!! I MUST try this out this summer, and I only tried Peruvian pastries once before, so I am excited to test this out! Oooooh I just love everything about this! This was so good! I have not made a recipe of yours yet that hasn't been a winner! Well this was absolutely delicious! The beef was tender, the veggies crisp, and the flavor was delightful. I chose to spray my fries with olive oil spray, and it was a little light so next time I would want to be sure that I used enough oil, but they still cooked up great, just not as browned as I would have liked. My partner enjoyed it just as much as I did. YUM. Will definitely make again! I love lomo! We go for Chifa all the time…have everything to make this already-Saturday's dinner…thanks! Add some beef broth when you add the soy sauce. Gina, all of your recipes are so delicious – each one is more amazing than the last! 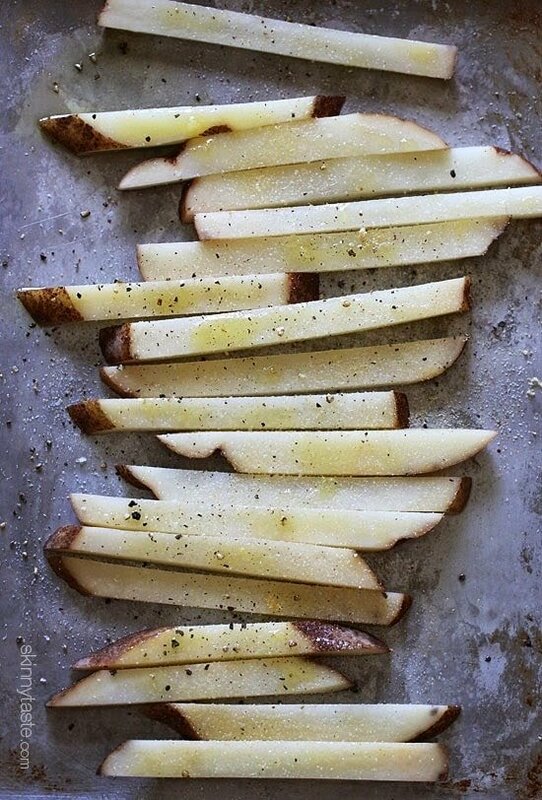 One question: whenever I bake sliced potatoes in the oven they always seem to take forever (sometimes over an hour). Do you do anything before putting them in besides tossing them in oil and spices? When I make "oven fries," I cut up the potatoes and then zap them in the microwave for 2-4 minutes (depending on how much I'm making) to get them started cooking. Really cuts down on oven time and as far as I can tell doesn't effect the final product. Kristen, thank you so much, this is really helpful!! Do you add any water to the potatoes when you zap them or just by themselves? Gina, you've become a visitor in our house about 3 to 4 times a week! My husband says, "That woman doesn't know how to make a bad meal!" Can't wait for the cookbook! That's so sweet, thank you're husband for me! There is a restaurant called Ceviche 105 here in Miami and this is the dish that I always get! I'm a vegetarian so they leave out the steak and add extra veggies. It is SOOO good. I'll definitely have to try your version! We were in Peru in January and took a tour that introduced us to some Peruvian food. It was delicious, so I'm delighted to see this recipe, which also sounds delicious. I'm looking forward to trying it. This sounds totally delish! 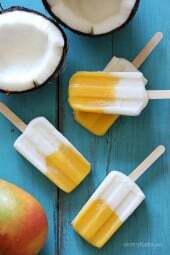 I MUST try this! Never had Peruvian food! My daughter and her Peruvian BF made this dish for us.Truly delicious and they also baked potatoes in oven.So good!Thanks! Just curious, why do you list the old ww points? Some people still use the old points. I'm curious about reheating, too. I live alone and if it reheats well, I could have the leftovers for lunch the next day. But not sure about the potato — it would lose it's crunch, I'm afraid. In that case, I'll just halve the recipe, using a smaller potato. Also, Gina, am I correct in assuming that the PP value does NOT include the slice of avocado? To be honest I love this dish best the second day because the flavors all get soaked up in the potatoes. They will inevitably be a little on the soft side but since you eat it all together, vs french fries on the side of a burger, you won't mind! I would halve it for one and correct, avocado is extra. I have been looking for a lean version of this since I first saw it on Diner, Drive-ins and Dives. Thank you so much!! I am so glad there are others out there who don't hate on potatoes. My friends think I'm crazy when I try to explain that potatoes aren't actually BAD for you. With the skin on, they contain so many nutrients, and are fairly low in calories for being as filling as they are. This recipe looks delicious and so easy and fast! I love that it has the potatoes in it! My best friend was Peruvian growing up, and I used to beg my mom to let me eat dinner at their house! I loved all the spices and flavors her mom would use! I lived with a Peruvian family in Cusco for a month and I got to eat sooo much lomo saltado. It was amazing! But the general diet of potatoes and meat led me to a number on the scale I'd rather forget. I like the sounds of a lightened up version…and one without their aji amarillo! I found it once, but haven't been able to find it since. Can't wait to try this! Weird question I know but can you substitute the beef for chicken or any other meat? I've never made/had it with chicken, but I have seen it on Peruvian restaurants menu with chicken. Good luck! yes you can!. I'm peruvian, and I made 'chicken' saltado the other day at home. I used fresh chopped parsley instead of cilantro , and it came out delicious . In Peru we do not add bell peppers to this dish. I am sure Gina's version is delicious though, so I will try it out ;). Yes chicken works too! And correct, I added the yellow bell pepper for extra veggies, flavor and color. So excited to make this it is my favorite Peruvian dish! This looks great – want to try this out! My husband is Peruvian and this is my favorite dish! I would love to try your lighter take on the recipe.. thanks for sharing! I made Lomo Saltado the other night from a recipe found online because I wanted it so badly but the flavor was not right. I am so excited to try your version as I am always crazy about your recipes!! OMG this recipe is awesome! Not only is it delicious looking, but it serves 2! I struggle with recipes that serve more because I usually end up eating all of it since my husband is a picky, picky eater. I'm so going to try this as soon as I can! Going to make this tomorrow night! Thank you, Gina! Thank you SO much! I had lomo saltado at a Peruvian restaurant in LA a couple of years ago and fell in love with it. This recipe looks delicious, I can't wait to make it for my family! My favorite Peruvian meal, looks delicious! As a Peruvian, I would add a fried (or poached) egg on top. We add eggs to everything, lol! True Peruvian! So does my husband!!! It's mild, but you can leave it out for the kiddos! I made this last night and while it was really good, it was really spicy too. I used 1 jalapeño for a doubled recipe and 16 hours later my finger tips are still burning. Maybe I just came across a really hot one because this is the first time this happened to me, but next time I will go with 1/2 jalapeño for 4 servings (and we do like spicy food). Potato bad for you?? Who has been spreading such lies? You are right, it's the toppings and preparation that make food bad. Anything natural is good for you. Of course, too much of one thing can never be good. In any case, this recipe sounds delish! It reminds me of fajitas, my favorite Mexican food. Thanks for sharing! I know, I always laugh when people comment such lies!